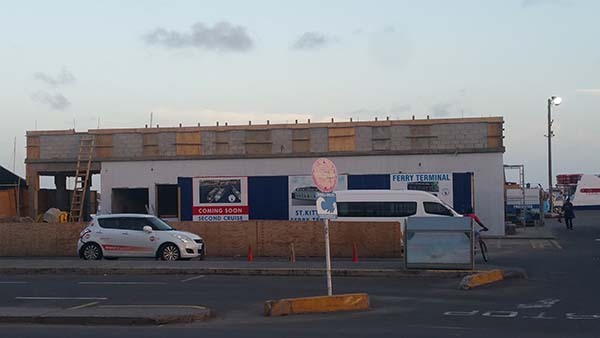 Basseterre, St. Kitts – Passengers from St. Kitts travelling to Nevis via ferry will soon be the beneficiaries of a brand-new modern Basseterre Ferry Terminal as the government and the St. Christopher Sea and Airports Authority (SCASPA) near completion of the facility. Construction on the new facility started in early June and is expected to cost the government about $100,000. It is just a few weeks away from completion. Speaking exclusively with the Observer, Minister of Public Infrastructure Ian ‘Patches’ Liburd indicated that the construction is near completion and identified the purpose for the upgrade. Liburd explained that completion should be in the next two weeks of the modern facility for passengers going to and from Nevis. He spoke to the amenities that will be on offer in the new facility. The Observer also questioned Liburd on plans to build a second cruise pier and he indicated that the start of that project is imminent, pending some details relating to financing. “Construction is imminent; we are just finalising details as it relates to financing,” he said. “Cabinet should meet on that issue on Monday.” He further added that the term of construction is estimated at 12-18 months. Earlier this year, it was announced that construction on the second cruise pier in St. Kitts was set to begin in June and to be completed for the 2018 cruise season. It was also indicated that some preparative work has already begun between the Ministry of Transport and the Ministry of Tourism. Liburd also gave an update on the proposed plans to build a new east line bus terminal. He further noted that they are hopeful by the end of this year the project will be complete. “Being optimistic, we are hoping to complete it by the end of this year, but, for sure, by early next year we will have a brand new east line bus terminal,” he said.